Prime Minister Narendra Modi will meet US President Donald Trump at the White House on Monday. Prime Minister Narendra Modi addressed the Indian community in Washington DC. Washington: Prime Minister Narendra Modi addressed the Indian community in Washington DC after meeting chief executives of major US companies on Sunday. 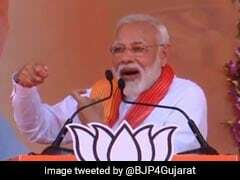 In his speech, PM Modi spoke about the three years of his government and the growth of the foreign ministry through social media and technology. He also spoke about India's successful surgical strikes, pointing out that no country in the world questioned it. He also said that while India is a peace-loving and law-abiding nation, it will not hesitate to strongly retaliate when provoked. For the first time, not one nation in the world raised a single question, about India's major step to conduct surgical strikes against terror camps on Pakistani soil. Surgical strikes proved that India, which normally follows restraint, can also defend its sovereignty if needed. In the last three years, there has not been a single stain on my government. Our foreign ministry, in particular our foreign minister Sushma Swaraj, has shown the way in helping people. Anyone in trouble tweets to her and she promptly takes action. Governments in India have failed and fallen due to corruption and cheating. People of India do not like corruption.